Filling: bring the cream to the boil on a Glem hob, take it off the heat and add the liqueur. Pour the mixture onto the chocolate, stir to dissolve it thoroughly and leave it to cool before adding the mascarpone cheese. Pastry: rub the cold butter into the flour, potato starch and sugar. Then bind the pastry with the egg and the yolks and add the flavouring. Divide the pastry into two parts and add the cocoa powder to one of them. Wrap the two pieces of pastry in food-approved film and transfer to the fridge for 60 minutes. Roll out the pastry until 3 mm thick, then cut out discs of the light-coloured and squares of the chocolate pastry. 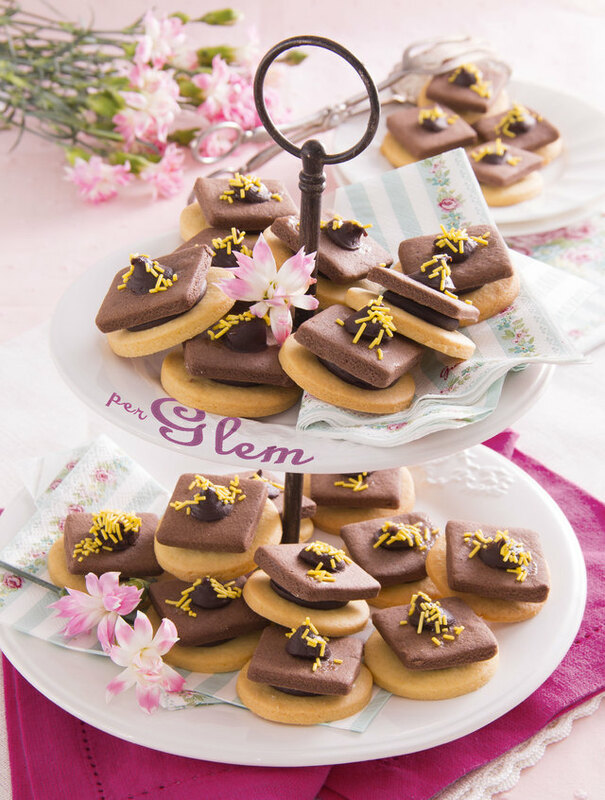 Place the biscuits on two baking trays lined with greaseproof paper and bake at 175° for 15 minutes using the circular element + fan of a Glem oven. Remove the biscuits from the oven and leave them to cool on a grid. Put the filling in an icing bag with a medium-sized round nozzle and apply a knob of filling to each disc. Place a square biscuit on top, and finish with another knob of filling. Brush the surface of the biscuits gently with a brush dipped in jelly and stick the sugar strands to them.